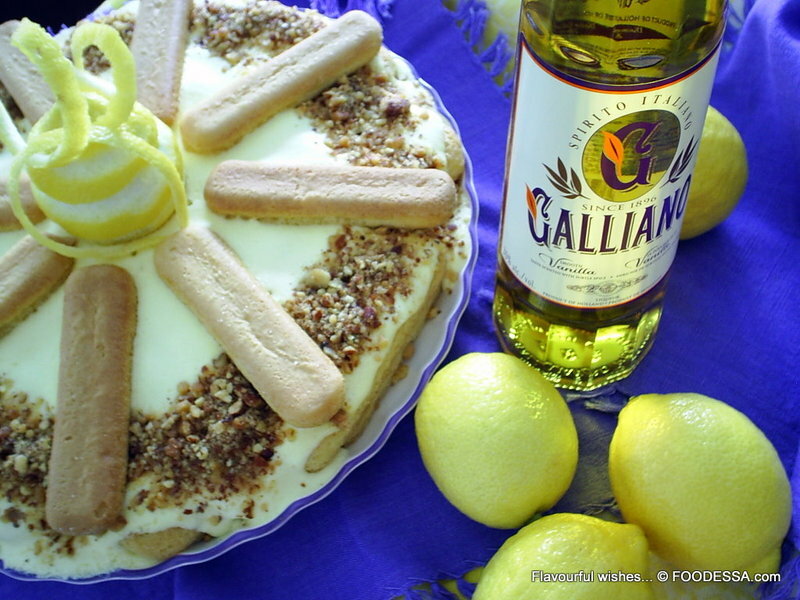 This lusciously creamy and decadent LEMON TiraMiSù gets an added 'Pick-Me-Up' from the smooth and aromatic spirited GALLIANO liquor.
. >>> NOTE: Non-Alcoholic version: Instead of the 'Galliano' liquor...it can be replaced by a blend of: a touch of honey...vanilla and anise extracts. 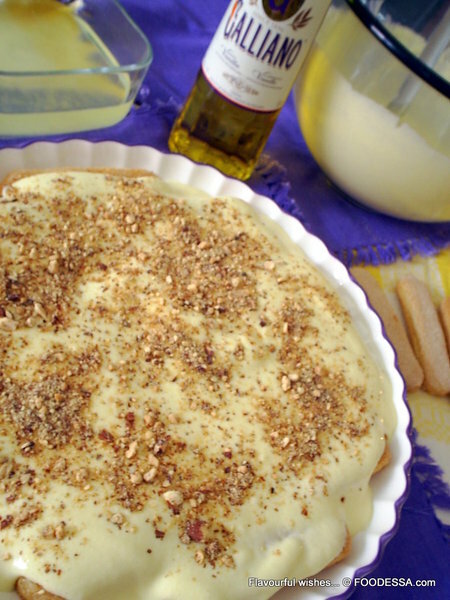 Finely grated ginger as well as a hint of nutmeg can be added also.
. Although, I usually use a higher sided platter, I wanted to create something a little more elaborate for a special occasion. 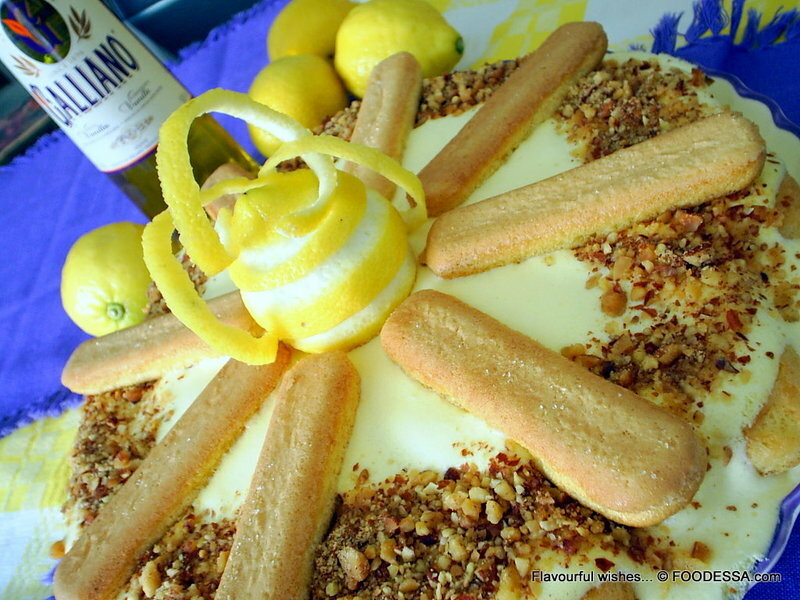 A round presentation platter with slightly raised sides with a diameter of 12 inches (30cm).
. About 1 hour ahead of time, take out the mascarpone cheese and eggs out of the cold. Set aside.
. 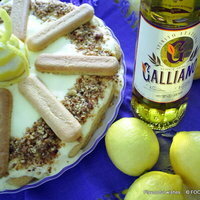 LEMON - 'Galliano' mix: In a medium bowl, combine the lemon juice, liquor and water. Set aside.
. MERINGUE: In another medium bowl and with an electric mixer, beat the egg whites with the pinch of salt until you get slightly soft peaks. 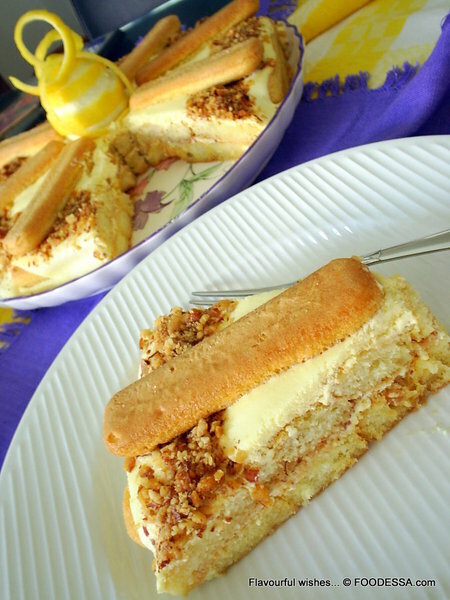 Continue beating while adding half the quantity of sugar until medium-stiff peaks have been realized. Cover and place into the refrigerator until needed.
. 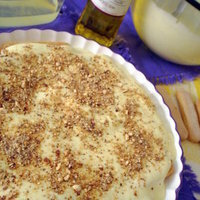 CREAM mix ('Zabaglione'): Meanwhile, in a large bowl, combine the egg yolks and the remaining sugar. With the mixer, immediately beat them together until a thick creamy pale consistency is achieved. Add the mascarpone and continue to beat the mix until smooth consistency.
. MERINGUE and the CREAM to combine: Now, with a spatula, gently fold the meringue mix into the cream mix. Finish by adding the finely grated zest. Once more, cover the bowl with a plastic wrap and refrigerate for a minimum of 30 minutes.
. 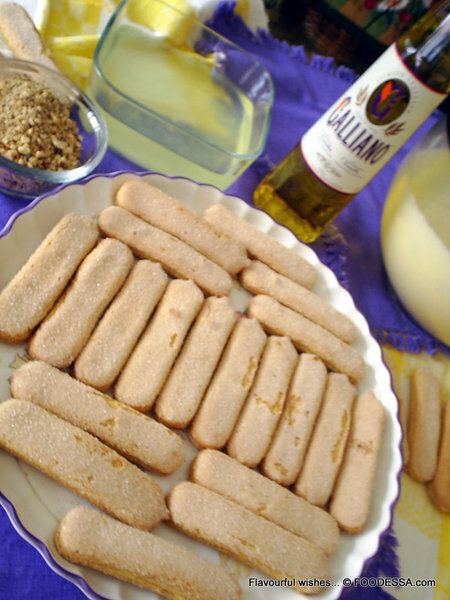 ASSEMBLY of the TiraMiSÃ¹: Prepare the platter of your choice and figure out the layout as well as pre-distributing the first layer of cookies to facilitate the initial part of the assembly. You'll probably need to break some cookies in half in order to fit the complete surface. This will avoid any surprises while in the midst of having soaked cookies on hand. Important note: For this particular chosen presentation platter...the first two layers held a total of 20 savoiardi cookies per level. The remaining 8 cookies served as decoration and placed like a star pattern branching from the center. It is best and more efficient to work as quickly as you can. 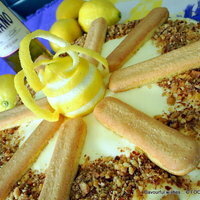 To wet the cookies into the LEMON mix, hold one cookie in each hand as you DIP --TIP --TWIRL --LEAK both cookies simultaneously in order to avoid over soaking them. Immediately transfer cookies onto the platter as you place them side by side in a single layer within your pre-designed layout. With the aid of a ladle and spatula...spread a 1/2 of the CREAM mix over the first layer of cookies. Scatter, the first 1/4 cup (60g) of the roasted chopped nuts throughout the surface. Note: the cream may seem âliquidyâ...don't be concerned. Once the TiramisÃ¹ sets in the fridge, all the ingredients will set together into a unified delicious mass. 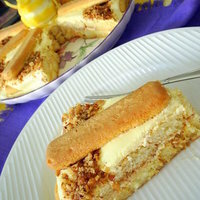 Repeat another layer of soaked cookies and spread the remaining CREAM mix.
. 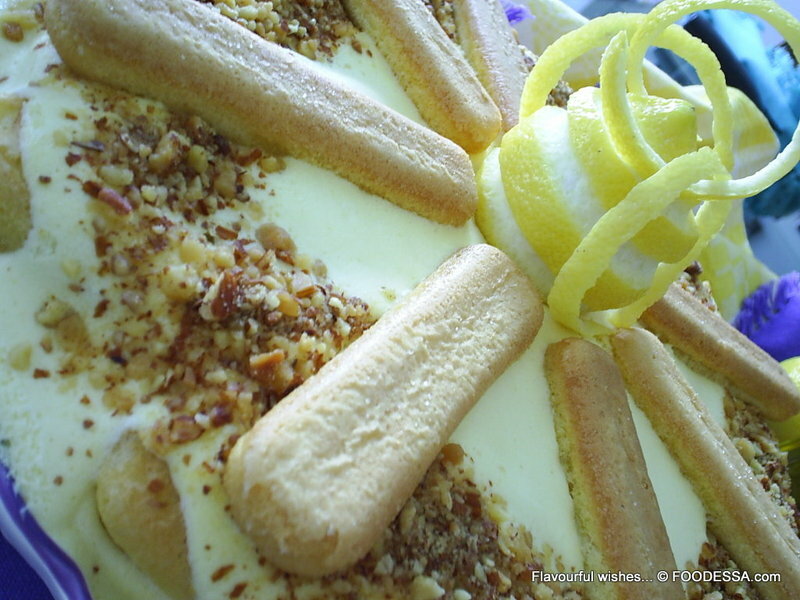 DECORATING: Around the perimeter of the cake, generously scatter the remaining roasted chopped nuts. 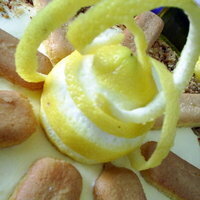 in the center, leave a small space for a decorative lemon with a carved out twirl. From that point, place evenly the 8 remaining cookies branching out from the center like a star pattern. 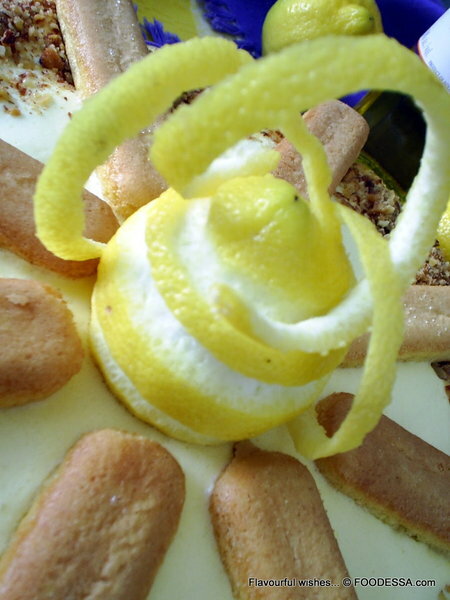 For the center focal point, a fresh, well washed lemon can get carved. Leave the yellow skin in between and place the swirled peels creatively around it.
. CHILLING the TiraMiSÃ¹: Since this type of dessert truly benefits from being prepared a while before serving...it is highly suggested to place a few upward toothpicks and cover it with plastic wrap. Chill it for a minimum of 4-6 hours. For every additional hour it gets to set and relax, all the flavours will marry together and you will ultimately be rewarded with superior results. Leaving it alone overnight is better. 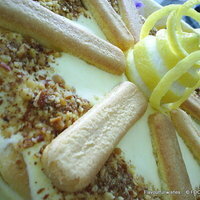 Its freshness can also be held refrigerated between 2-4 days before serving. Can you tell me where you buy your Italian cookies. I can't find them anywhere in my area. Maybe I am not asking for the correct name. Are they called something else. Thanks for your reply in advance. 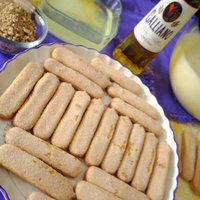 A Savoiardi cookie is a very popular Italian ladyfinger cookie. If your regular grocer doesn't carry it in their ethnic Italian section...you'll need to require if there is a specialized Italian store. Here in Montreal we find them everywhere...even in the regular cookie section. Looks delish. i must try this. This looks like a fabulous recipe. I love that you don't have to bake it! I'm going to have to try it this summer. I'll be saving this one. !